The culmination of the two-day conference on Asian Liberal Parties in Power: Getting There, Remaining There, organized by the Council of Asian Liberals and Democrats (CALD) and supported by the Friedrich Nauamnn Foundation for Liberty (FNF) was the delegates’ attendance to the inauguration of the 15th President of the Republic of the Philippines Benigno Simeon Aquino III on June 30, 2010. 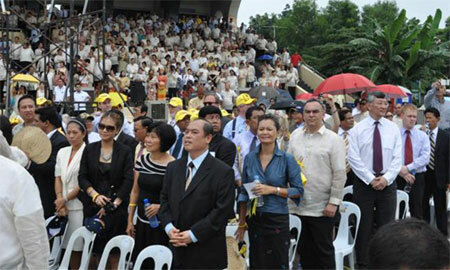 Mostly members of parliament, the CALD delegates that included Red Liberal de America Latina (RELIAL) President Otto Guevarra Guth and Liberal International President Hans van Baalen, MP, along with more than half a million Filipinos endured the sweltering mid-day heat to observe democracy’s most distinguishing hallmark – the peaceful transfer of power from a nine-year rule of Gloria Macapagal Arroyo to a liberal president. Mr. Maung Maung, Secretary-General of the National Council of the Union of Burma, described the event as a “marvellous sight,” especially for someone like him who lives under a despotic regime that shows no signs of giving up power.